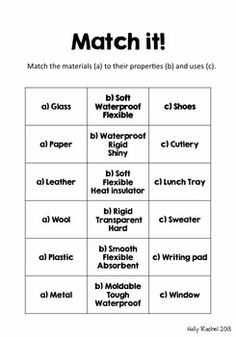 Our Topic this term is Materials. A material is any substance that has a name. For example: chalk, paper, wood, iron, air, water, clay, plastic, rubber, stone, leather, wax. Everything is made up of materials. When we want to make something we need to choose the best material for the job. The property of a material is something about it that we can measure, see or feel and helps us decide whether or not it is the best material. Most materials have more than one property and can be natural, man-made, strong, weak, heavy, light in weight, rough, smooth, shiny, dull, hard, soft, flexible, brittle, magnetic, non-magnetic, transparent, opaque, electrical conductor, electrical insulator, conductor of heat, thermal (heat) insulator, burns when heated, does not burn, melt easily or not melt easily. Materials exist in three states: a solid, a liquid or a gas. Materials can sometimes be changed from one state to another, perhaps by heating them – for example, ice is a solid which becomes a liquid when it’s heated. We are looking at and investigating the way different materials may change.